After Hublot’s invention in 2011, Magic Gold, the world’s most scratch resistant 18 karat gold, thanks to an alloy between boron carbide (ceramic) and 24 karat Gold, the Swiss watchmaking brand has devoted its innovative approach to ceramic. 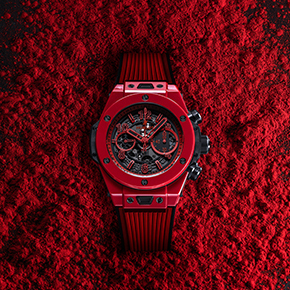 By creating a new material – the first vibrantly colored ceramic – Hublot has once again used its limitless imagination to achieve a world’s first. Exclusively designed and produced in-house, in the Hublot Research & Development (R&D) department, this invention has been patented. 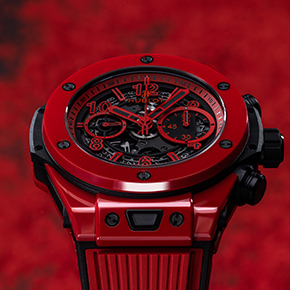 A triple tour de force, the colored ceramic invented by Hublot is innovative both in terms of the material itself, and the manufacturing process. In addition to the vibrant color it is also harder than conventional ceramics. Hublot brings depths of color to ceramics. The Hublot R&D department and Metallurgy & Materials laboratory have succeeded in inventing a magic formula that allows the creation of vibrantly colored ceramics. This has previously not been done in industries using technical and aesthetic ceramics. In addition, Hublot has refined all the procedures necessary to produce every component of the watch case from this special material. In total, it took Hublot four years to master this discovery and develop it from initial idea to industrialization. The invention is 100% Hublot and the expertise has been patented. Hublot continues to make strides in its research of materials. This newly developed ceramic is incredibly dense, boasting a hardness of 1500 HVI compared to 1200 HV2 of conventional ceramics. This results in an extremely resilient material. The color is achieved through a major innovation whereby a fusion of pressure and heat sinters the ceramic without burning the pigments. Having mastered the basic hues with this method Hublot is now ready to introduce a whole new world of colored ceramics to its watch collections. 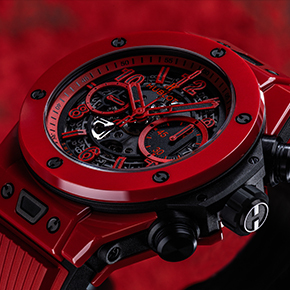 The first vibrant color release is vibrant red, which also increases the hardness of the Hublot ceramic.